Generating actionable leads from social media is heavily dependent on the ability to stay top-of-mind with prospects and to create quality engagement with that audience. Here is how we’ve been able to turbo-boost our social media output and engagement using a web-automation tool called Zapier. Zapier is a tool that allows automation of web-based tasks. This allows you to use two web-based programs in tandem. You set up a “trigger” action on a website which tells another program to take an action. For example, you could make it so that every time you tag an incoming email as “Tweet”, it will automatically pull the link and post it to your Twitter page. With over 250 available applications and thousands of possible action/trigger combos, your creativity and willingness to experiment are the only limits to what you can do with Zapier. We have created several “Zaps” to help make us more efficient with social media marketing. For example, every time we get a new follower on Twitter, an automatic tweet to that new follower is triggered thanking them for joining our community, and in some cases, points them to a recent blog post or a relevant landing page. In fact, we have seen an increase in our blog subscribers of over 200% since we created our first Zap 4 months ago. Here are a few of our favorite Zaps we use for more efficient social media marketing. As mentioned above, this Zap allows us to generate more engagement by effectively starting the conversation with our new followers. Create a short tweet that shows new followers that you appreciate them. More often than not, we get replies which allow us to further engage with the user. Don’t be afraid to play with this one. You could try posing a thought-provoking question or asking them to take an action, like retweeting the post, or even taking a simple survey where followers can either retweet or share to express their vote. Create a simple archive of your tweet history with this Zap. This makes it easy to keep your entire posting history in one place for easy review. And once you set up the program, it’s automatic! This one is a personal favorite as it allows us to repeat certain tweets indefinitely at later times. 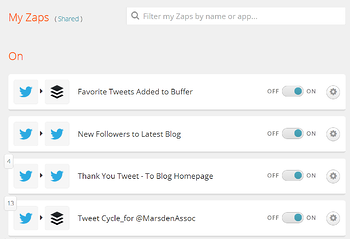 Each new tweet gets put back into our Buffer App schedule. This make it easier for us to duplicate our “evergreen” posts (i.e. those posts which are always relevant, regardless of time and date). Just don’t forget to go through it every once-in-a-while to delete tweets that are no longer relevant and refresh the content. Setting up the tool and choosing how to apply it is a matter of the time you are able to allocate and your specific goals. But by taking advantage of automation, you are able to see returns far beyond what could have otherwise expected. It can be seen every single day in increased social media engagement and in an increase in blog views and blog subscribers. To learn more about time-saving tools like this, sign up for our blog.